Living in the Los Angeles area, I've experienced the joy of driving along the pacific coast via Pacific Coast Highway (AKA: Highway 1) many times. My favorite PCH drive is in Malibu, where the views of the beaches and ocean are spectacular. When I began researching the possibility of traveling further north on PCH to see some of the sights, like Hearst Castle and Big Sur, I learned that National Geographic had named the 123-mile (198-kilometer) stretch of PCH between Morro Bay and Monterey as one of their “Drives of a Lifetime,” and so I decided to plan my adventure there. My friend and I began our trip on a Sunday morning in late July 2012. On our way from Los Angeles to Morro Bay, we decided to make quick pit stops at some touristy, but fun, attractions. Our first stop was Pea Soup Andersen’s Restaurant in Buellton for bottomless bowls of their tasty Split Pea Soup and shakes that were so thick that they required spoons rather than straws. 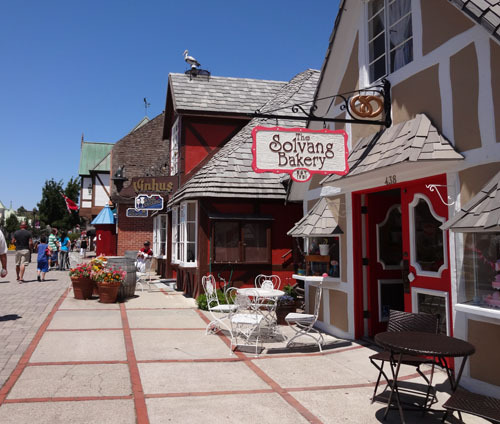 For dessert, we headed to nearby Solvang. After reading a review on Trip Advisor where a woman gushed about the Danish Waffle that she had tried at Mortensen’s Bakery, I had to try one myself. 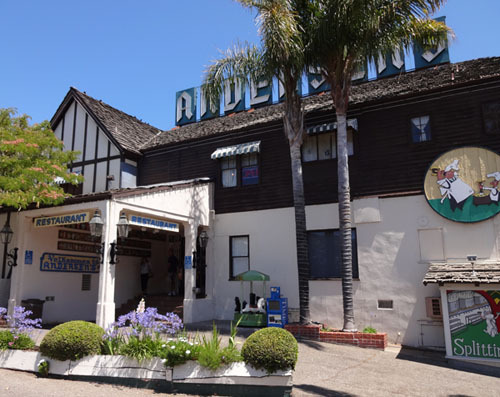 As soon as we arrived in Solvang, we headed directly to Mortensen’s. I checked out the pastries on display, and they did look good, but I was still full from lunch at Andersen’s. My friend and I worked up our appetites by wandering the streets of Solvang lined with small shops bustling with Sunday tourists. I looked at the pastries at every bakery we passed, but none of them looked as good to me as the ones at Mortensen’s, although the oat Florentines at The Solvang Bakery looked so inviting that we end up snacking on the chocolate-dipped, sweet, chewy cookies sandwiching fluffy chocolate filling and as we explored. On our way out of Solvang, I picked up one of those Danish Waffles from Mortensen’s to go. 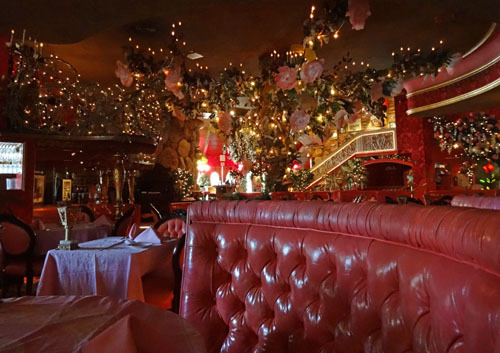 Our final pit stop was Madonna Inn, where we checked out the over-the-top pink dining room (only open for dinner) decorated with lights and large, cloth, pink roses. Madonna Inn also has an attractive, but unremarkable, café, although there are big, yummy-looking, pink-frosted cakes in the dessert display case. Finally, we made our way to PCH to begin our “Drive of a Lifetime.” As PCH entered Morro Bay, the views started to become interesting. Large rocky hills blocked our view of the Pacific Ocean, but the mist-shrouded mounds were so intriguing that I didn’t mind. 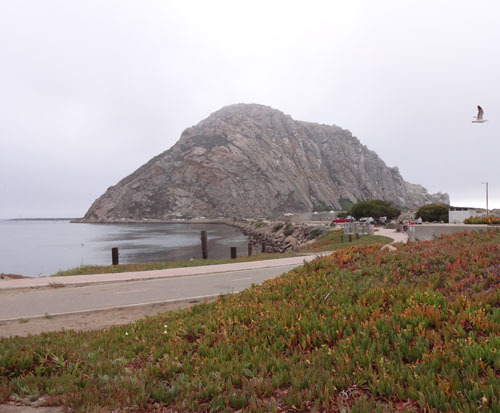 In Morro Bay, one of the main attractions is Morro Rock. We exited PCH and drove through the town of Morro Bay, quickly spotting Morro Rock, a large rocky lump sitting in the bay. We drove to the base of the rock and jumped out to explore. I had read that otters were sometimes visible on the bay side of the rock. Having spent hours watching playful otters in zoos and aquariums, I was eager to see them in the wild. I scanned the water with my eyes. Almost instantly, I spotted a few otters swimming on their backs. Through binoculars, I watched the adorable animals rub their faces and fur with their paws, occasionally twirling their bodies in the water or diving in search of a snack. 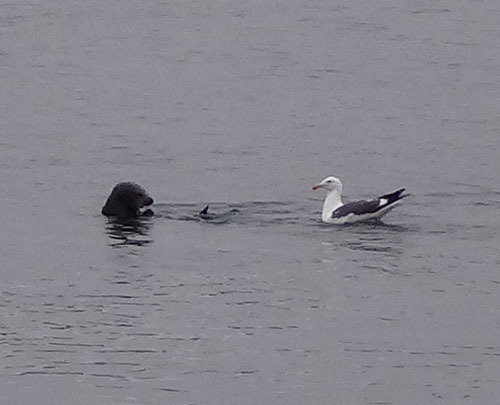 One otter seemed to be hanging out with a seagull, or perhaps it was the other way around. Maybe the seagull was hoping for some of the otter’s leftovers. 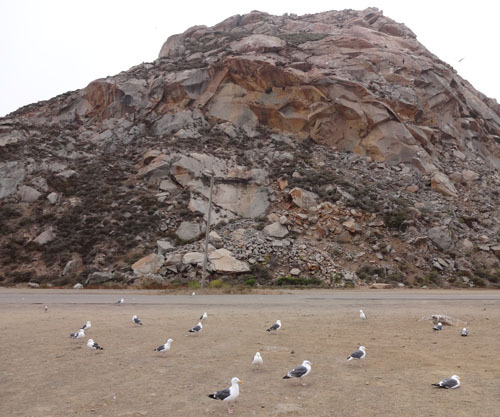 There was plenty of wildlife to be seen at Morro Rock. Brown squirrels with pretty, light-colored markings on their backs scurried among the rocks along the shore, noisy seagulls hung out on the bay side of the rock, and black seabirds (cormorant) perched on the other side. 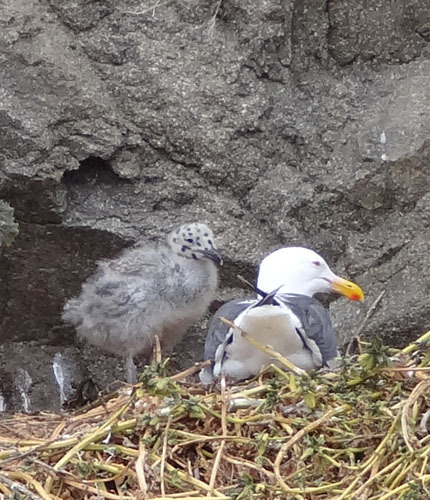 We walked along the trail on the bay side of the Morro Rock where we spotted a cute, gray, spotted, young seagull with an adult. An interpretive sign along the trail explained that Morro Rock was a volcanic plug, the hardened magma core that was left after the rest of an old volcano had eroded away. Those rocky hills that we'd seen from PCH were also volcano remnants. We walked as far as we could along the bay side of the rock, until the trail ended in boulders that disappeared into the ocean. Back in our car, we rejoined PCH and headed to our stop for the night, Cambria. I did this in July 2012 in California, USA.